This is about 1/2 gallon of the resulting brown sugar-tomato syrup that was leftover from my tomato figs. It's percolating away with champagne yeast, which is a very strong, resilient yeast, which is important if this turns out to be a higher alcohol liquid. I didn't check the starting gravity on this, as I was rushing to get everything done the night I started this. Plus, with so many tomato solids still in the liquid, I doubted a correct gravity could even be determined. But as I'm not too concerned about this being a "drinking alcohol," I'm not too bothered to not know its potential ABV %. So now this is just bubbling away, the champagne yeast eating up all the sugars and turning them to alcohol. It smells intensely of tomatoes, which I'm happy about. With so much brown sugar, I worried this would just be like a raw cane-sugar alcohol. But I remembered later on that no water was added to the syrup, it was all drawn from the tomatoes themselves. Plus the extra seeds and pulp also contributed their tomatoey essence to this syrup. 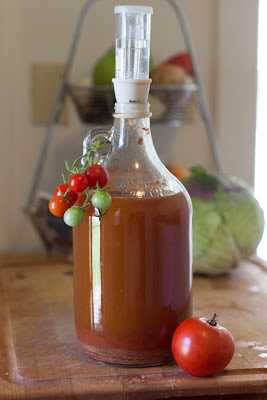 Once this finishes fermenting out, I'll pour in a bit of the vinegar "mother" off my cider vinegar to start converting this tomato ethanol into acetic acid. In the end, I think it'll make a very unique "fruit vinegar" that'll be a great addition to olive oil for dressing vegetables.